Co. Londonderry: Ballymoghan, Ballyronan, Bellaghy (2), Brackagh Slievegallion, Brancran, Carnamoney, Castle Dawson (2), Clady, Desertmartin, Draperstown, Gulladuff, Inniscarn, Lissan Upper, The Loop, Maghera (2), Magherafelt (2), Moneyhan, Moneymore, Rocktown, Salsterstown, The Six Towns, Springhill, Tobermore, Tullykeeran. The Board also included 9 ex-officio Guardians, making a total of 39. The Guardians met each week on Thursday at 1pm. The population falling within the Union at the 1831 census had been 74,542 with divisions ranging in size from The Six Towns (population 960) to Castle Dawson (5,426). The new Magherafelt Union workhouse was erected on a six-acre site at the north-west of Magherafelt. Designed by the Poor Law Commissioners' architect George Wilkinson, the building was based on one of his standard plans to accommodate 900 inmates. Its construction cost £6,600 plus £1,460 for fittings etc. The workhouse was declared fit for the reception of paupers on 10th March 1842 and admitted its first inmates the following day. Magherafelt general view from the east, 2003. 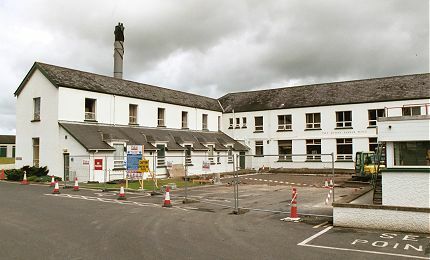 Magherafelt entrance block from the east, 2003. 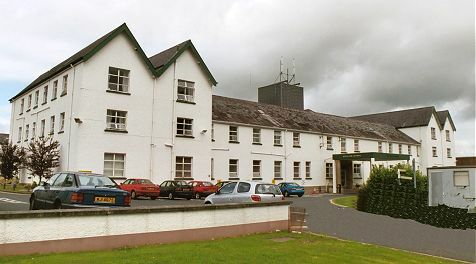 Magherafelt main block from the south, 2003. Magherafelt rear of main block from the west, 2003. 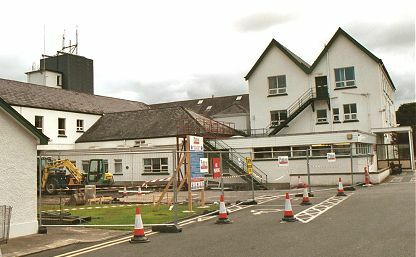 Magherafelt chapel and infirmary blocks from the south, 2003. During the famine in the mid-1840s, temporary wooden sheds were erected to accommodate an additional 160 inmates. In 1847, a 40-bed fever hospital was erected at the east of the workhouse. The workhouse had two burial grounds. The first, in use from 1842-47 stood just to the north of the infirmary. From 1847-1941, a site just beyond the railway was used. In 1895, Magherafelt was visited by a "commission" from the British Medical Journal investigating conditions in Irish workhouse infirmaries. Their report noted a long list of deficiencies including insufficient nursing staff, particularly at night, and poor sanitation, with raw sewage from the hospital leaking into the yards. Further details are available in the full report. At the 1901 census, the population of the Union was 38,992 with 10 officials and 149 inmates in the workhouse. The workhouse finally closed on 24th August 1941 with the remaining inmates being transferred to Coleraine. It was originally planned to use the building as an emergency war hospital, but by the time conversion work was completed, the war was over. 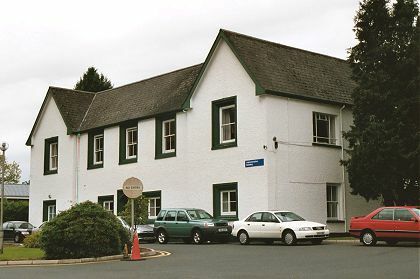 Instead, the site opened in August 1945 as the Margherafelt and District Hospital, later renamed the Mid-Ulster Hospital. The fever hospital was demolished in 1973 but the other buildings largely survive. Public Record Office of Northern Ireland, 2 Titanic Boulevard, Titanic Quarter, Belfast BT3 9HQ. Holdings include Board of Guardians' minutes (Jan 1844 - June 1948); Dispensary minutes (Feb 1852 - 1899); Indoor register (March 1842 - March 1929); Indexed register of births (1879-1916); etc.